Twitter HD is a free Twitter client app for Windows 8. This is basically a simple and lightweight client app using which you can do almost everything you do with your Twitter account in the Web Browser. That is, you can post tweets, view other users’ tweets, search and follow people, retweet the tweets posted by other users, or reply to them. You can also mark the tweets that you liked as your favorite. 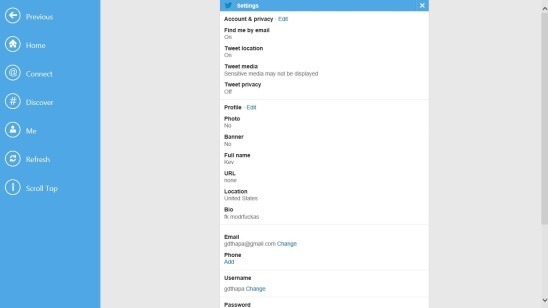 Besides that, this free Windows 8 Twitter client app lets you to change your Twitter account settings from within the app itself. Twitter HD is a very good medium to get an access to your Twitter account directly from the Windows 8 Start screen, rather than opening Twitter by a time consuming process on your web browser. All the Twitter junkies should definitely try their hands on this free Windows 8 Twitter client app. You can get Twitter HD in the Social Category in Windows Store, or can use the Windows 8 Search Charm (Win + Q ) to search for the app. Like I mentioned above, Twitter HD is a free Twitter client app for Windows 8. Therefore, everything that is available on Twitter website, can be accessed using this app. 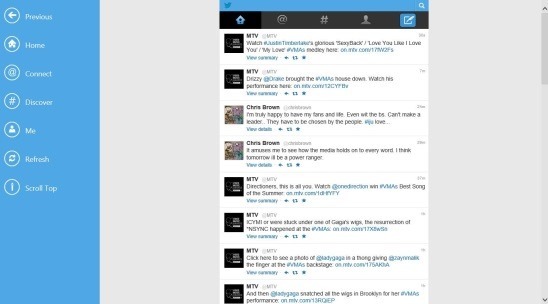 The good thing about the app is that, it kept the Twitter interface as the way it is. This not only makes it easy for the users to use the app, but also gives them a familiar environment to try new things. The app comes with the same layout, but with added features of Windows 8. Obviously, the app needs your Twitter credentials to get you connected with your Twitter account. Once you get logged in, the app will show you the Home page. This page shows you all the latest tweets posted by the people with whom you are connected on Twitter. You can easily scroll down to see other Tweets. Scrolling up and down is pretty smooth. In case, you have scrolled too down, and you want to go directly to the most latest tweet, then you can simply click on the “Scroll Top” button on the ribbon at left side of screen. The ribbon mentioned above also contains buttons naming Home, Connect, Discover, Me, Refresh, and Previous (as you can see in the screenshot above). These buttons are not only useful, but they also make doing everything easy and quick. Simply click on the desired one, and you’ll get a page corresponding to that particular button. In order to post a new tweet or start a new conversation click on the Tweet button on the top side of screen, and you’ll get a screen to tweet. The text limit is 140 characters. Discovering a user is very easy, and this Twitter client app gives you different options to do that. The first way is using Windows 8 Search Charm. The second way is to click on the Connect button, and the last way is to click on the Search button at the top right of the page. optionally, you can also use the Discover button for the same. 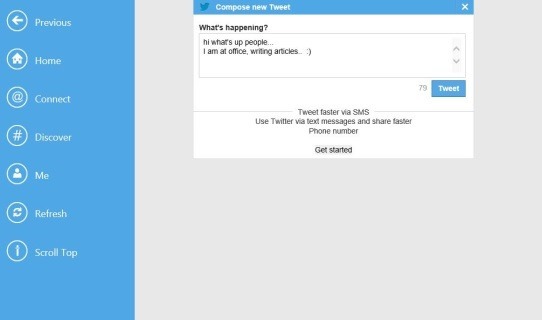 Good Twitter app for Windows 8. Offers all the features that you get with Twitter web account. Can change Twitter account settings from within the app itself. Also check out free Facebook client app and Instagram client app for Windows 8. Twitter HD is a handy Twitter client app to get access to your Twitter account on your Windows 8 PC. It is functional and has a good design. Navigation between pages is quick and easy (depending on your internet speed). I couldn’t find any complaints or issues. Definitely a good free app for the Twitter junkies. 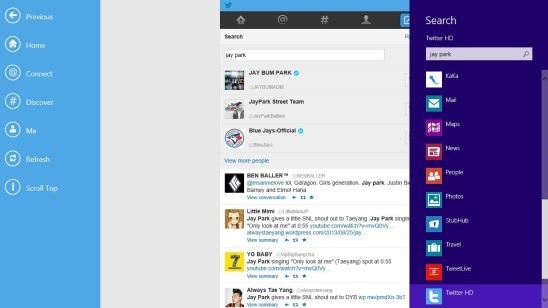 Also check out another free Twitter client app for Windows 8.